We’ve sifted through lots of robust evidence to bring you what’s on this website. We’ve used three sources for classroom evidence, and two from the cognitive sciences, plus general findings from neuroscience. We then used the Learning Cycle diagram to give all of this evidence some structure, bringing us our Six Steps for Outstanding Learning. 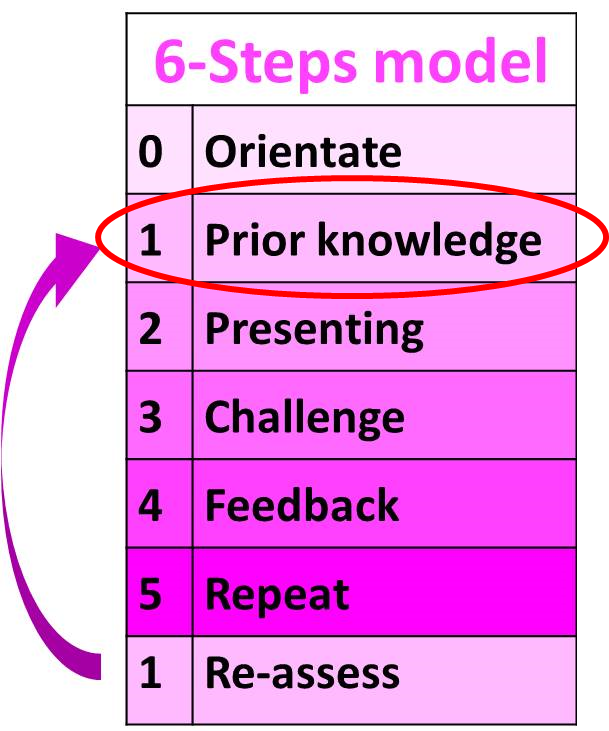 Step 1: Prior Knowledge is about connecting with what our students already know before we start teaching a new topic. Learning consists of links between neurons in the brain – when we’ve learnt something, there is a network of connections in the brain. 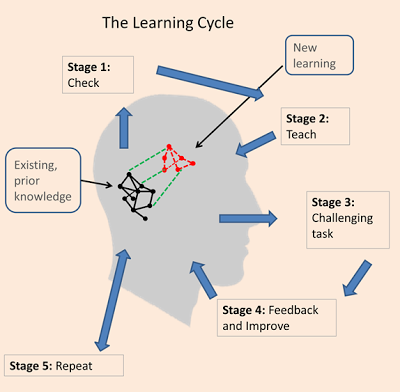 The Learning Cycle diagram is a great visual to help us to see how the learning process works. On the diagram you can see black, green and red connections. The black connections on the left. These represent existing knowledge on the subject, which could be your student’s existing knowledge, or your knowledge as a teacher, (depending on who we’re talking about). The red connections represent the new learning we’re trying to teach a student. The green connections link the two. Not only do we have to create the connections between the new knowledge, we need to link the new knowledge to the existing knowledge. This is the difference between learning by heart and understanding: if those green lines aren’t there, then you might have remembered it, but you won’t properly know it. We can illustrate the difference as follows. If you know the words of a song and somebody says to you “What’s the word one from the end of the third line?” you have to sing through until you get to it. But, if you’re a biologist and somebody says “Can you tell me the two compounds which combine in photosynthesis?” you don’t have to sing the whole book through – you know the answer. That’s the difference between ‘learning by heart’ and understanding. New learning needs to be connected to what you already know. Consequently, patching up prior knowledge is particularly effective for low-ability, apparent low-ability, or low-achievement. Without the prior knowledge, the new learning can’t be understood; it can only be vaguely ‘remembered’. So checking and repairing prior knowledge is the first stage of learning: . Then we can use other effective methods, such as using analogies, to link the new learning to things which are already known. Join the Network to find more videos, research and resources on linking to prior knowledge. David Ausubel was a psychologist who contributed to educational psychology and cognitive science. He is best known for his work on the importance of prior knowledge and his research into Advance Organisers. There’s a great video on www.study.com that gives an introduction to the ideas we’ve talked about here. Click here to check it out. Writers such as Daniel Willingham and Daisy Christodoulou emphasise the importance of good factual knowledge in helping new learning. Willingham quotes experiments which show that the ‘rich get richer’ in learning a subject (whether history or car mechanics). This is because students with lots of existing knowledge in the subject have more long-term memories to link to and so new links can be made more easily than those with less general knowledge in the subject.